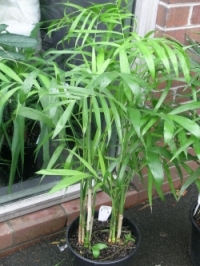 Lucky Bamboo = Dracaena sanderiana (left), a house plant in the Agave family. Give it bright light, average soil. Although it can be kept pretty dry when grown in normal potting soil, this plant's amazing endurance when it is grown simply as rooted cuttings in water and pebbles has made it very popular. Wash the foliage every couple of weeks to manage spider mites. Note: True bamboos cannot survive in standing water. Heavenly bamboo = Nandina domestica (right), a very useful evergreen landscape shrub in the Barberry family. 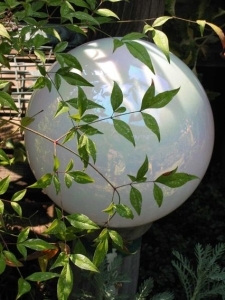 Tolerates sun or shade. Foliage hardy to 10°F, plant resprouts from 5°F. Winter brings bright red leaf color, orange berries. Many cultivars, ranging from 6" to 10'. 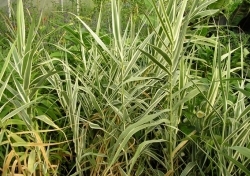 Giant Reed = Arundo donax (left), an invasive plant that was introduced into California from the Mediterranean. 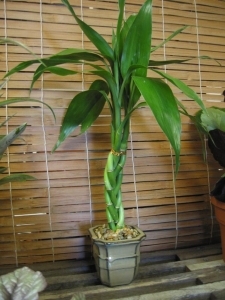 Often mistaken for a bamboo. In the grass family, but unlike bamboo it reseeds prolifically and is displacing native vegetation in many parts of the state. Also cultivated to make reeds for oboes. 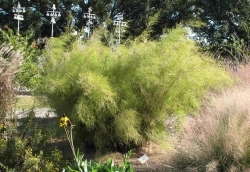 Variegated form (shown) is sometimes sold as an accent plant for water gardens. Bamboo Muhly = Muhlenbergia dumosa (right), native to Arizona and northern Mexico. Beautiful ornamental evergreen clump-forming grass to 3 – 6' with a soft, mounding habit reminiscent of Bambusa multiplex, and foliage somewhat like an Otatea. Probably hardy to 20°F. Bamboo Palm = Chamaedorea seifrizii (left), also called Reed alm. Mexican native, one of the most common indoor palms. Very tolerant of low light, but also fine in bright indoor light. Palms need even moisture and a fast-draining soil. Best soil mix is regular potting soil with additional pumice or perlite, or just use a cactus soil mix. Hardy outdoors only in frost-free areas. Wash off every week or so to manage spider mites.